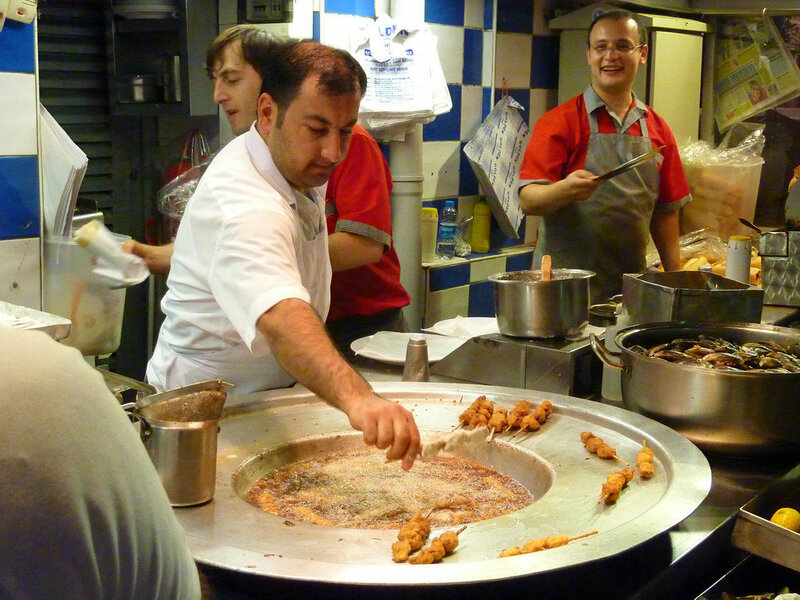 As many metropoles around the world, Istanbul has a rich street food culture. 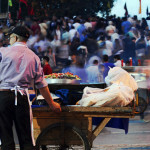 As many metropoles around the world, Istanbul has a rich street food culture.One of the must-see stop for street food, eating out in Istanbul is a part of daily life. 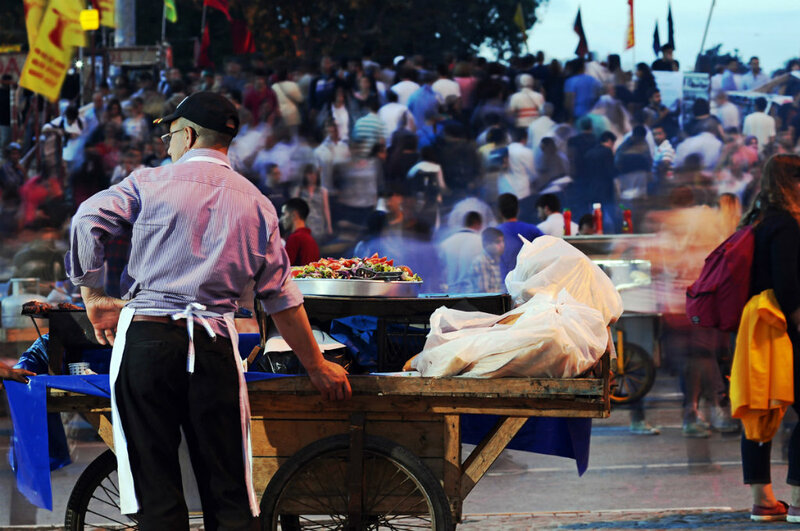 From street vendors to small buffets streets, Istanbul’s street food is full of choice. It’s whether just-out-of-the-oven simit or a balık ekmek boat there is always a tantalizing smell lingers in the air. Istanbulites swing by these street vendors at any time of the day: For a quick breakfast, to have lunch, for a snack in between or to end a long night. 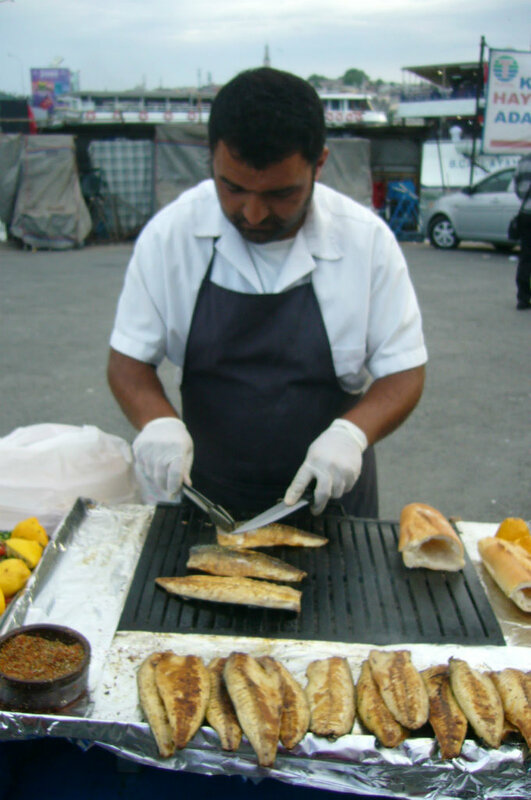 Street food in Istanbul is mostly being cooked and sold by skilled and experienced usta’s; the masters. Pastries like simit and börek are mostly distributed from bakeries and some of the food you see at the streets are home cooked by the family of the vendor. Encircled by Marmara, Bosphorus and Golden Horn, sea has a definite influence on Istanbul. 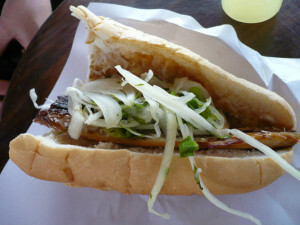 This influence no doubt appears on menus; even at street food. 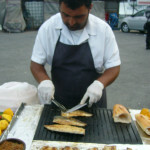 Balık ekmek which is a fish sandwich is one of the most common food in Istanbul. These dirt cheap sandwiches are simple: mostly a mackerel fillet quickly grilled, salted and sprinkled with pepper and served with lots of greens and preferably onions, accompanied by a little touch of lemon. Balık ekmek can be found anywhere around the fish markets, both at Karaköy and Kadıköy, Bosphorus shores and Golden Horn but the most delicious balık ekmek you will find in Istanbul will be at the Galata Bridge and on the boats at Eminönü. Börek is a family of baked or fried pastries made of several thin layers of phyllo. There are different kinds, based on fillings, shapes or cooking type. Fillings vary such as cheese, minced meat or vegetables like potatoes or spinach. 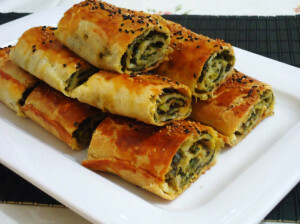 A popular element of Ottoman cuisine, börek is an essential food around Turkey. Mostly accompanied by tea, börek can be eaten as breakfast or a snack. Found at trolleys, there are also small and big sized shops called börekçi all around Istanbul. 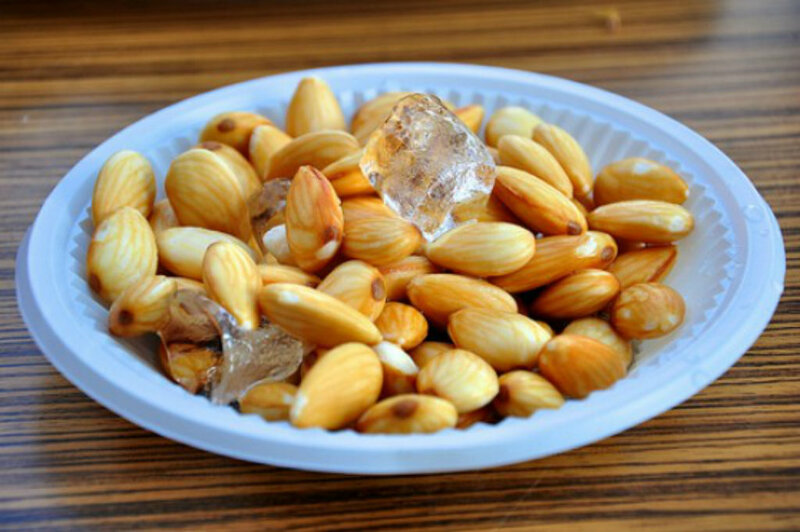 Buzda badem literally almond on ice is a well known street food, generally served around pubs or restaurants. This is simply a tray with a big ice cube and fresh almonds on it. These fresh almonds were left in water for a few hours and served on ice to peel cover easily. A delicious snack to go with the drinks, almond on ice also gives an energy boost. Literally translated as raw meatballs, çiğ köfte is a popular street food speciality of southeastern Turkey, especially Adıyaman an Şanlıurfa. Çiğ köfte originally prepared by bulgur (a kind of wheat), onions, tomato, pepper and raw mincemeat. The mixture getting kneaded by hand like a dough with a lot of spices so that the meat got cooked. Although this is the traditional recipe, the version on the streets and as small franchise shops that can be seen all around Istanbul sell meatless çiğ köfte due to hygienic necessities by law. A totally vegan street food today, the favorite way to eat çiğ köfte is to roll it in a lettuce leaf and squeeze some lemon on top. Ask for nar ekşisi, pomegranate syrup or some chilli if you want to spice it up. Çiğ köfte is also served as dürüm, which means wrapped. Note that meat is replaced by ground walnut, ask before if you have allergic concerns. 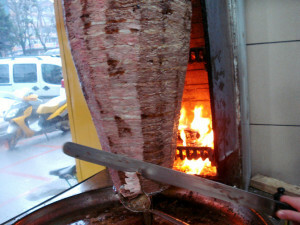 This Turkish dish made of meat cooked on a vertical spit, traditionally veal or beef but also a mixture of these with lamb or chicken. Probably the most familiar Turkish street food sold in other countries as well, doner kebab served wrapped in lavash or pita or as a sandwich. 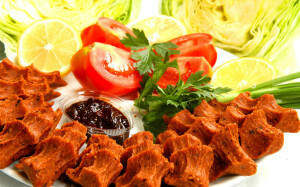 Toppings include tomato, onion, lettuce, pickled cucumber and chili, doner kebab is also served as a full meal such as Iskender kebap or on the rice, pilav üstü. 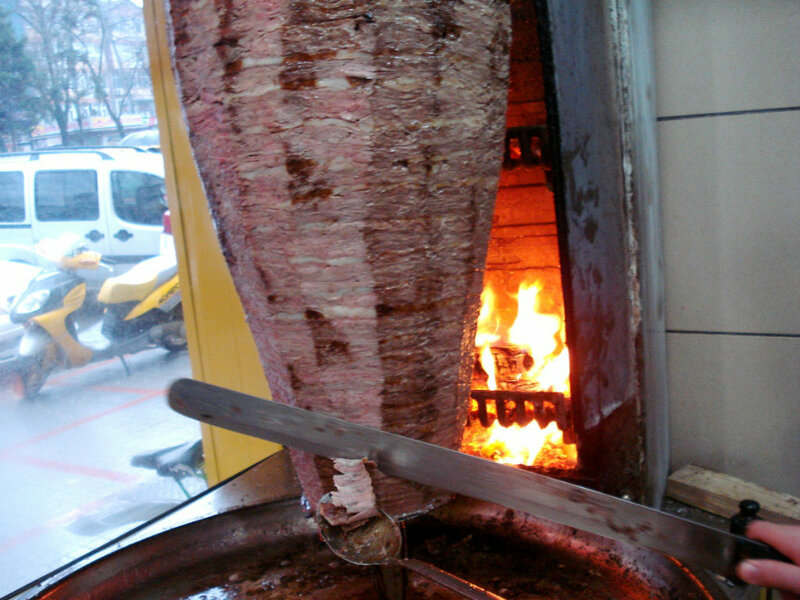 Döner is a common fast food and can be found almost everywhere. 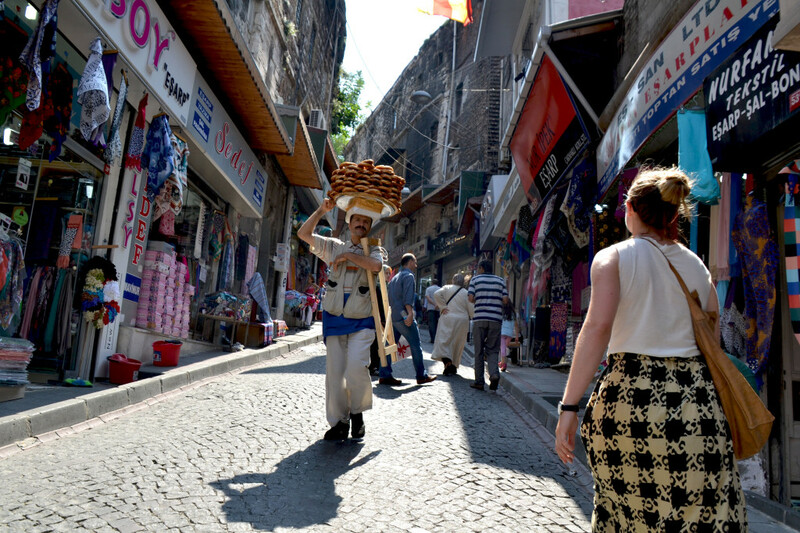 When you wander around Istanbul, you meet round shaped pastry wafers sold inside plastic bags; mostly at street peddlers or at ice cream shops. This round wafers are called kağıt helva, which can literally translated as paper halva. 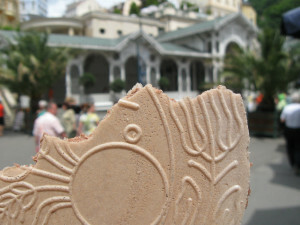 A favorite taste among the children, kağıt helva can be filled with ice cream or eaten plain. 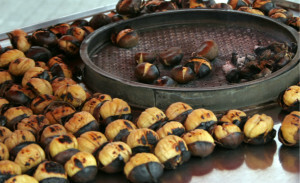 Roasted chestnut is an easy snack that can be found on the streets of Istanbul especially at autumn and winter season. 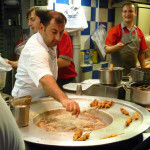 Roasting chestnuts is a tradition around Turkey. It has almost a nostalgic sense on people of certain age. It brings out the childhood memories on winter. Before central heating became so popular, stoves were in use. At winter nights, it used to be a custom to gather around the stove and roast chestnuts. Still alive with its modern ways, roasted chestnuts is a delicious way to warm yourself up at cold days of Istanbul. 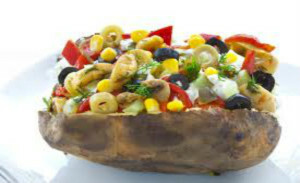 There are a number of stalls or small shops making jacket potato around Istanbul. Wrapped with foil and baked in special ovens, the potatoes are cut from the middle and insides are mixed with butter and yellow cheese. After this, all sorts of food and sauce can be added like pickles, mushrooms, sausages, olives and mayonnaise. There are a numerous selection of ingredients and you can have your custom made jacket potato. 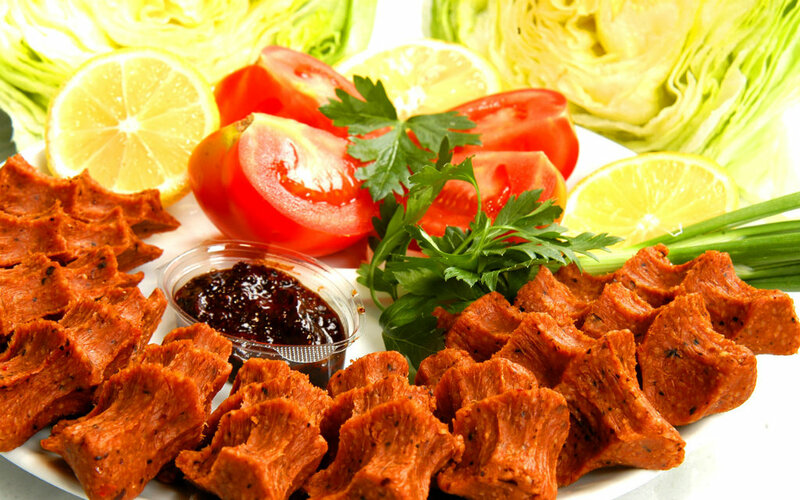 Kokoreç, which is grilled sheep intestines with tomatoes, green peppers seasoned with spices and roasted on a screwer is a traditional snack. 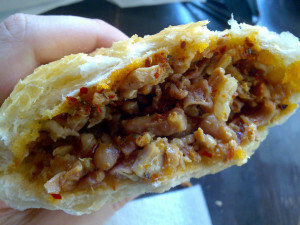 Also found around Balkan countries, kokoreç is a popular street food and eaten especially after a night out. Found at pushcarts around the city, there are also some small shops who sell kokoreç. Kokoreç mostly eaten inside half (yarım) or quarter (çeyrek) of a toasted bread and accompanied by ayran, şalgam (turnip juice) or turşu suyu (pickle juice). Boiled or grilled corn on the cob is sold from carts around the city, especially during the summer season. 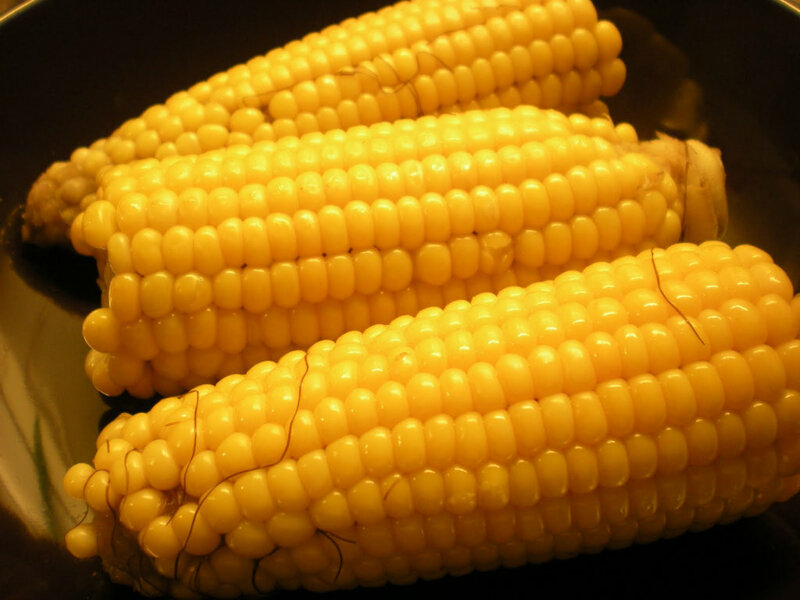 Freshly boiled or grilled corn on the cob mostly served on green corn leaves and sprinkled with salt. This fantastic walk around snack’s mostly cheap but price may vary from cart to cart and area of the city. 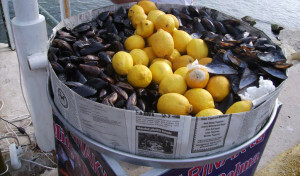 Midye dolma is one of the most commonly seen street food in Istanbul. These little stuffed mussels are a must taste for seafood lovers. It’s simply boiled mussels with a spicy rice filling inside. Just open one, squeeze some lemon and eat it in one bite. As for some people it is always hard to leave the midye dolma stall, some people had never tried it in their entire lifetime. If you have concerns about bacteria, maybe you can save yourself for a fish restaurant. At this point: To try it or not to try it, that is the question. Displayed inside a glass cabinet, this rice dish a cheap dirt option for hungry Istanbul wanderers. 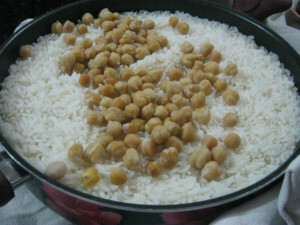 Nohut pilav comes with chickpeas and boiled chicken on top as your choice. Most people add black pepper as complement. Ayran, traditional yogurt drink, similar to plain lassi in India, would be the best choice to eat like a local at a nohut pilav stall. Also called as candy floss, this street taste is undoubtedly one of the most popular street foods especially between the kids. Well-known around the world, this colorful cloud shaped candy is a form of spun sugar. In past made by street vendors with a simple machine, today the candy floss are manufactured and packed than sold by vendors. 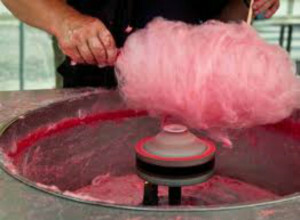 A nostalgic street food for many, cotton candy is the cheapest way to add some color to a day. Simit is simply a circular kind of bread covered with sesame seeds. Common in Balkan and Middle East countries simits size, crunchiness and taste vary by region. Istanbul’s simit is different than Ankara’s and Izmir’s has its own characteristics. Simit has a long history in Istanbul. 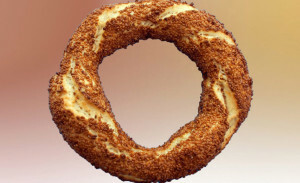 Records from 1525, shows that simit has been produced in Istanbul since 1525. Simit is the cheapest and easiest way to eat. Generally served plain or as breakfast with tea, cheese or jam, simit has its own rituals. Like drinking tea with simit is a custom, another yet more fun custom is to feed the seagulls with simit from the deck of a ferry. Often sold by street vendors on trolleys, simit can be found at bakeries. At the last few years, chain simit bakery/cafés are common with their variations of simits such as with olives, sunflower seeds or yellow cheese. Dipped in molasses syrup and covered with sesame seeds, this centuries old recipe is an essential must taste food of an Istanbul trip. 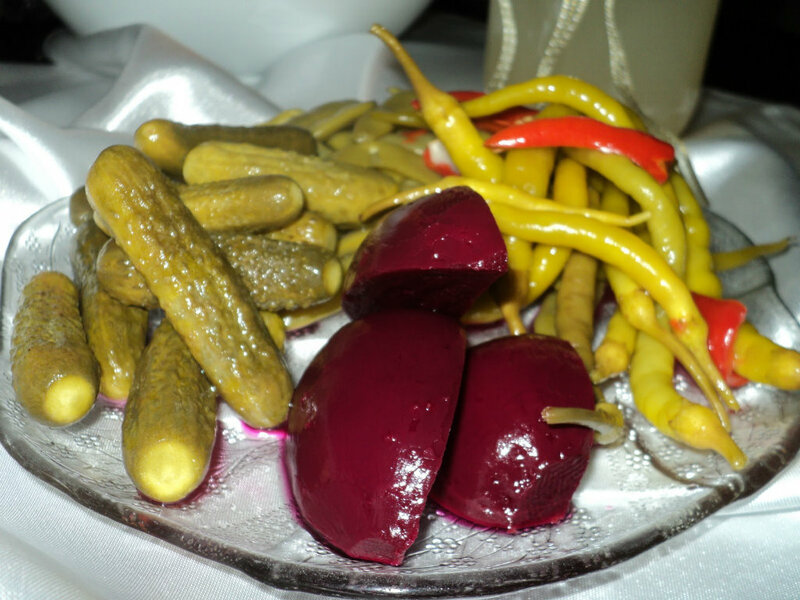 Pickled vegetables are very popular in Turkey, especially during the winter season. Most of the households make their own pickles as a preparation to winter. A companion for many Turkish food, pickles are also outside of the houses. Sold at street vendors and small shops, different kinds of pickles can be found all around Istanbul. Not only pickles, but also turşu suyu, pickle juice is loved and drank by many.